Baking my own bread has always been a rather intimidating prospect. 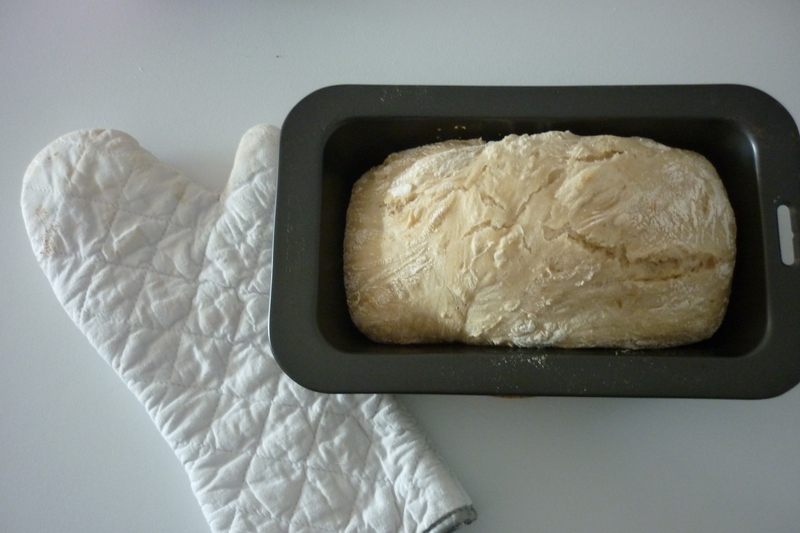 I’m not sure why I became so afraid of it, perhaps visions of being up to my ears in sticky, flour-y dough, and kneading and proving for hours on end scared me off. I love to bake, but spending hours in the kitchen on complicated recipes isn’t my first choice of how to use my time. And now there’s a seven month old in the house, well, it’s just not an option anyway! 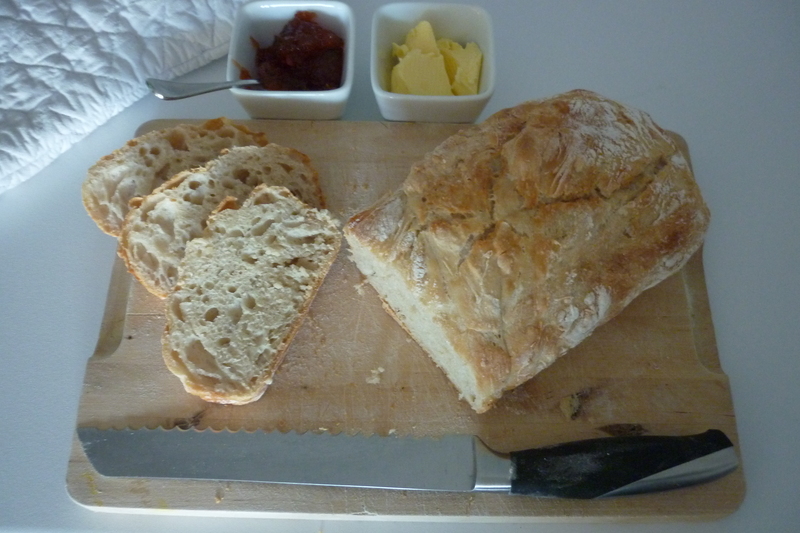 Warm bread with homemade jam and organic butter – dee LISH! 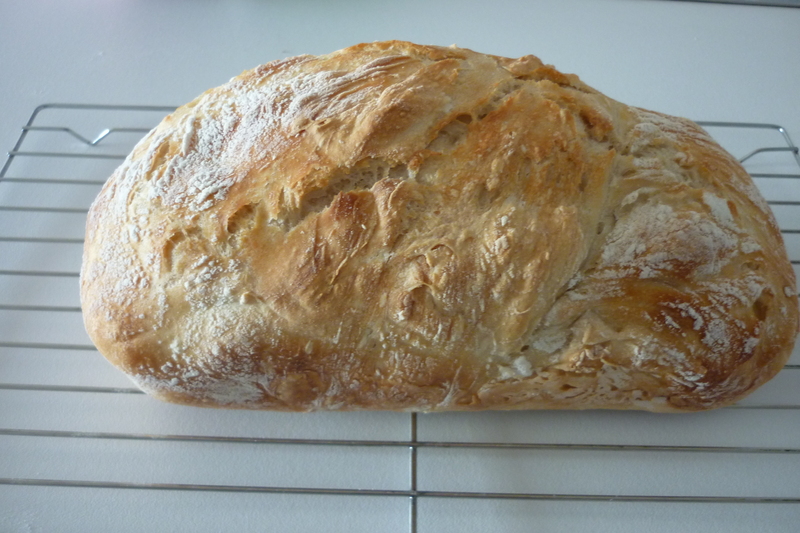 An episode of River Cottage (a fave UK lifestyle show of mine) inspired me to get my bread making on. I found what I thought was a good way to dip my toe in the dough at The Stone Soup; a foodie blog made just for me – and you no doubt! Jules creates and shares recipes with 5 ingredients, loves fresh and seasonal produce, and espouses the thrifty kitchen – what a trifecta! It is her recipe for Rustic Homemade Yeasted Bread (it’s titled Rustic Sourdough on the website, and even has a video!) that I’ve been loving up and raving about. My first attempt at this bread was with generic brand flour and table salt. It was freaking amazing. I was so excited I think I told everyone I knew, who – lucky for me, bless ’em! – at least feigned interest. This makes my first loaf of Jules’ bread cost less than $1 in ingredients. Without horrible additives. Making my house smell divine. I know. Its true! I couldn’t believe it. And. It takes 5 minutes to prepare. 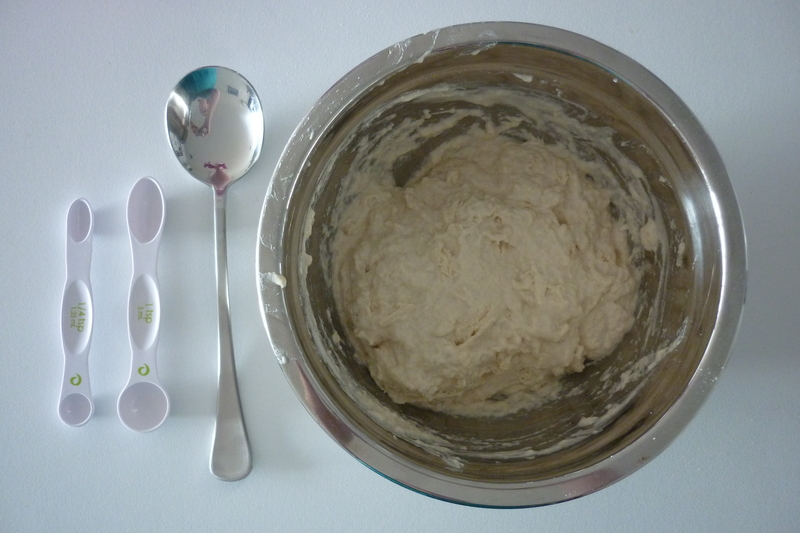 Mix in a bowl some flour, water, salt and yeast. Cover it with some cling wrap. Leave it for 12-24 hours. Tip it onto a floured surface; fold the edges in, place inside a floured tea towel for half an hour while you warm your pan and oven. 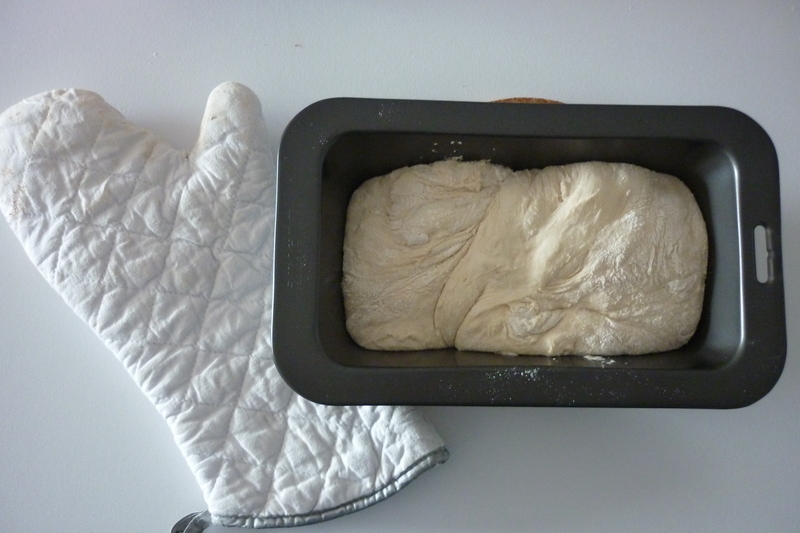 Plonk the dough in the pan, cover, bake for half an hour; take off cover, bake a further 15 minutes. Slather on some butter and jam and congratulate yourself on baking a beautiful, fresh, uncontaminated loaf of bread. Jules recommends using a round baking dish with a lid. I didn’t have one of those, so I used a shallow pie dish and some foil. 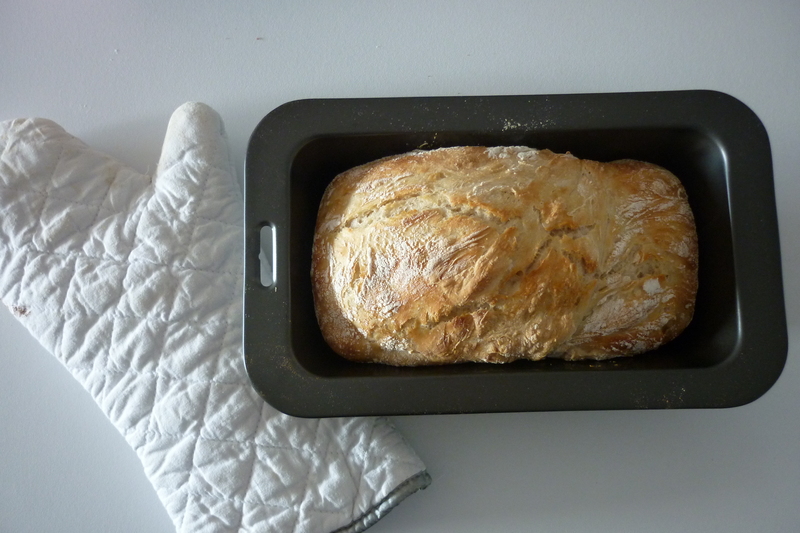 Then I experimented with a loaf tin and foil, with superb results – primarily so I can freeze some (so I don’t keep going back for ‘just another slice’ – far too tempting!) and make a good sandwich. I did reduce the baking time though – 20 minutes then ten. Just give it a try with whatever you have, it’s very forgiving. I usually make up the bread at night once bub is asleep and bake while we’re all eating breakfast. Today’s bread, however, sat for 23 hours before I turned it out of the bowl, and I think it tasted better when the yeast had extra time to ferment. 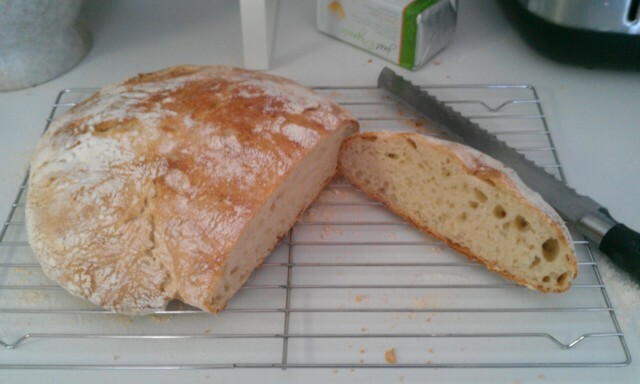 I have started using organic flour; it is nicer, a bit more moist and springy. But when we have to tighten the purse strings, I’ll have no hesitation in using generic flour for the benefits of good, wholesome, homemade bread. While you’re over on The Stone Soup, have a good look around. I particularly love her approach to minimalist menu planning, and her checklist for a minimalist kitchen is great – excellent for people setting up a new house. 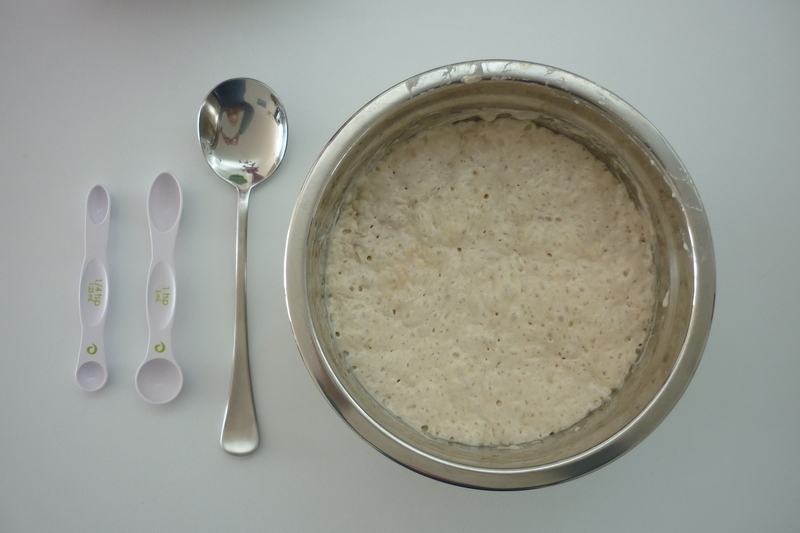 The next thing I’m going to do is make my own sourdough culture and make sourdough bread; I’m exploring fermenting my grains – like porridge, mmm – to make them more easily digestible a-la activating nuts, and to reduce the harmful effects of gluten. As someone with Hashimoto’s, gluten is something I need to kick. I have been able to do this in the past, and am going to wait until I finish breastfeeding until I quit again, mainly to spare bub from the detoxifying process that I’ll need to go through. However, any of you who have gluten intolerance or Coeliac’s disease will know just how sad gluten free bread is, and how expensive. It’s an ambition of mine to adapt this recipe to make a decent gluten free bread fresh at home, and I’ll share my results when I do. I’m hoping I can turn out something that is not just better than cardboard, but something that is yummy, inexpensive and that I can fit into my day. Spelt sourdough, perhaps? We’ll see! Do you guys bake your own bread? If not, give this a try! You will not regret it. Let me know how you go! UPDATE: SPELT IS NOT GLUTEN FREE! Fear not, I will pursue a yummy, no knead gluten free bread to bake at home, but Celiac.com has advised that it is not suitable for those with Coeliac disease. Spelt is much healthier than wheat flours, however, and is possibly okay for those with gluten intolerance, but if in doubt please be guided by advice from your health professional.